symposium at Bakersfield College Tuesday. 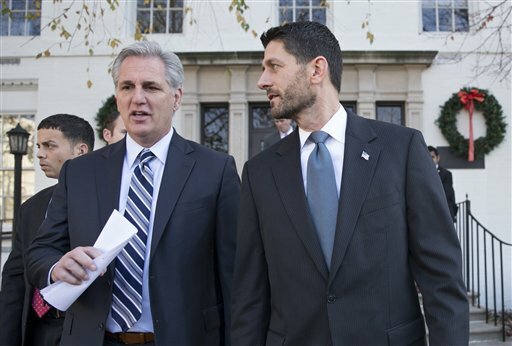 With Trump at odds with House Speaker Paul Ryan, Walters said Majority Leader McCarthy is in a unique position to be the liaison between Trump and House Republicans. "He is in a good position to play a larger role, and that can be good for California and Kern County," Walters told me. Another panel member, Marty Wilson of the CalChamber, said McCarthy was on the short list of people who Trump called on election night. Stay tuned. to ask his name. I will soon. And then there is the other side of the coin. There is a family that lives on Ina Court whose yard backs up to Auburn Street. This owner of a dog(s) has taken the time to FLING dog feces over his fence onto what he thinks is the easement of bushes next to the sidewalk. Well this lazy moron has such a great arm on him (her) that it makes the sidewalk. Guess who ends up cleaning up the mess? Yeah, the man with integrity!" * ... STARBUCKS: The downtown Starbucks at 24th and L streets lost a regular customer the other day when he was verbally assaulted by one of the many homeless men who hang out in front asking for money. "I walked past him leaving with my coffee and he muttered something," he told me. "I didn't really hear him until he screamed and me, stood up and flipped over the outside table and told me he was going to kill me." Sick of being hit up for spare change, he has sworn off the downtown location. * ... NORIEGA'S: I can only go a few months before I need a fix at Noriega's, one of the Basque treasures that has served our community for so many years. There are few things better than a hearty Basque meal on a chilly night at the iconic Bakersfield restaurant. My favorite: fried chicken night. * ... SPOTTED ON TWITTER: "My parents believed you should never go to bed angry. They were awake for the last 17 years of their marriage." * ... REUSABLE BAGS: This interesting note from reader Steve Hollick showed up in my mailbox: "I just was getting caught up on your columns and wanted to put in my two cents on the reusable bags. I ordered three canvas bags from www.feedprojects.com. Each of the bags bought feed a starving child for a year. They are super durable bags and I constantly get compliments on them. They hold a ton of groceries. Plus, it makes me feel good that I am helping out a child in need." * ... MEMORIES: I ran into a Bakersfield old-timer who was waxing poetic about growing up in a much simpler time. As a child, he said JBA (Junior Baseball Assn.) had fields across from Memorial Hospital where Gregg's Pharmacy stood. * ... MORE MEMORIES: And finally, Jean Burette added these memories: "I remember when the Bakersfield Californian was delivered in the evening, and once a month a man came to the door to collect for the bill. Oh yes, and I too remember the Union Avenue pool and also the pool at Hart Park. We used to enjoy badminton at Kern Union High School in the evening, supervised by Cap Harlson, and afterward go to Reed and Bell for a great root Beer."